23 February 2017. A handheld mechanical device that promises to reduce the cost and ease the work of minimally invasive surgery is being created by a spin-off company from University of Michigan. The device is a product of FlexDex Surgical LLC in Brighton, Michigan, and supported by a $1.4 million Small Business Innovation Research or SBIR grant from National Science Foundation. FlexDex’s device is a needle driver for laparoscopic, or minimally-invasive surgery, where surgeons make and work through tiny incisions. Laparoscopic is less expensive and traumatic with shorter recovery times for patients, but requires extra skills for the surgeon and often expensive robotic equipment for hospitals. The company cites data showing some 1.5 million laparoscopic procedures are performed in the U.S. each year across most surgical specialties, but even wider adoption is limited by the high cost of surgical robots, extra training needed for these sophisticated instruments, and complexity of some minimally invasive procedures. 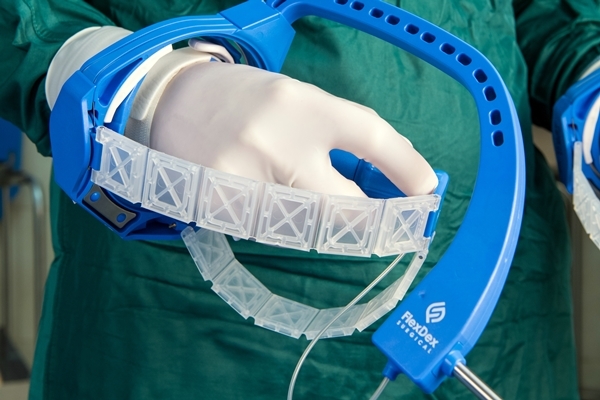 In addition, says FlexDex, current lower-cost mechanical, non-robotic devices to aid minimally-invasive surgery are either difficult to learn or lack the dexterity needed by surgeons. The company says its technology is designed to fill the need for an easy-to-use device to aid laparoscopic surgery that is also affordable for smaller clinics and hospitals. The FlexDex device is designed to supplement the work of a skilled surgeon. The device is worn on the surgeon’s hand, wrist, and forearm, and reacts to fine movements of the surgeon’s hand, thus acting as an extension of the surgeon. And because the device is driven by the mechanical actions of the surgeon, it does not require sensors, actuators, or computer-controls, keeping its cost low. FlexDex Surgical is a start-up company spun-off from the lab of mechanical engineering professor Shorya Awtar and pediatric surgery professor James Geiger at University of Michigan in Ann Arbor. Awtar’s lab studies dynamics and controls of flexible systems that mimic or parallel physical actions, as well as models for new kinds of machines and instruments used in manufacturing and health care, such as the FlexDex device. Awtar and Geiger founded FlexDex Surgical with entrepreneur Greg Bowles who serves as the company’s chief marketing officer. Awtar and Geiger are FlexDex’s chief technology and medical officers, respectively. FlexDex received an early-stage SBIR grant in 2013 to prove the technical and commercial feasibility of the device. The current second-phase award supports completion of the device’s development, verification, regulatory clearance, and commercial launch. The four-year grant extends through November 2018. Awtar tells more and demonstrates the device in the following video.